When Tony Kanaan first showed up at IndyCar Spring Training in February 1996 to make his Indy Lights debut, Bill Clinton was still in his first term as United States president. “One Sweet Day” by Mariah Carey and Boyz II Men was the No. 1 song in America. The first smart phone was still 11 years away. Kanaan has done and seen almost everything in his exemplary CART/NTT IndyCar Series career, which started in 1998. He won the NTT IndyCar Series championship in 2004 and the Indianapolis 500 presented by Gainbridge in 2013. He has won 17 races and 15 poles. Brazil native Kanaan has driven for some of the most well-funded teams in the paddock, with their vast resources and large teams of engineers. He also has raced for smaller teams, which must try to make the most of smaller budgets and staffs. So, if anyone knows the reality of competition at this level of open-wheel racing, it’s Kanaan, now 44. And he’s candid about the state of A.J. Foyt Racing as he enters his second season with the team in 2019, one of the leaders of its revitalization from the driver’s seat. “Come race weekend, you have to understand your limitations,” Kanaan said. “That’s the hardest thing to do. I’m in a constant self-check: Am I pushing these guys too hard? Is this our reality or not? You have to live your reality. Kanaan finished 16th and rookie teammate and fellow Brazilian Matheus Leist finished 18th in the NTT IndyCar Series standings last year during their first season with the team. Both drivers are back in 2019, and the team – led by four-time Indianapolis 500 winner A.J. Foyt and team president Larry Foyt – are driven to improve upon those results amid stiff competition this season. It’s a painstaking process, one that Kanaan admits is taking longer than he wants. But again, the wisdom gained from 21 seasons at the highest level of North American open-wheel racing helps Kanaan stay focused, motivated and patient with his team. And he knows there’s one place where both he and the Foyt team can accelerate their timetable for improvement better than anywhere – Indy. A.J. Foyt and Kanaan have circled the 103rd Indianapolis 500 presented by Gainbridge on Sunday, May 26 at the Indianapolis Motor Speedway as a showcase for their growth together. The “500” is an event circled on the calendar for every driver and team in the NTT IndyCar Series, but it’s even more special for “Super Tex” and TK. Foyt was the first driver to win four times at Indianapolis, in 1961, 1964, 1967 and 1977. He added another victory solely as a team owner in 1999 with Kenny Brack behind the wheel. He openly admits his career would never have reached its worldwide zenith without winning “The Greatest Spectacle in Racing.” He freely and often says Indianapolis made A.J. Foyt, not the other way around. Kanaan is no different, perhaps one of the reasons why he and Foyt have created such a strong, endearing bond over the last 16 months of working together. Despite rising through the ranks in karting and junior formulas on road courses, Kanaan took to the challenges of racing on the daunting, fast IMS oval quickly when he made his Indianapolis 500 debut in 2002 with Mo Nunn Racing. Since then, he has produced eight top-five finishes in 17 career starts in the “500.” He finally broke through with his first Indy victory in 2013, in his 12th start, at a record average speed of 187.433 mph. He also has led at least one lap in 14 of his 17 starts, breaking a record set by his boss in his 35 career “500” appearances. 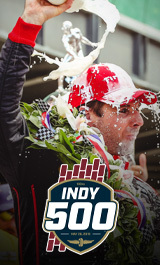 Kanaan’s Indy victory in 2013 gives him hope for success with Foyt this May at Indianapolis. He was in his second season with KV Racing Technology, a smaller team than the titans of the sport at Team Penske, Andretti Autosport and Chip Ganassi Racing. Kanaan and KV took a realistic approach to May within the context of the entire season, and it paid off. “When I joined (KV), we said: ‘What’s the biggest thing we can do? It’s win the ‘500.’’ For my boss (Foyt), that’s all he cares about. That’s the guy that lived that place. I could not finish a single race this year, and if we win the ‘500,’ that will be enough for him. There also may be a bit of numerical magic at work this May to help Kanaan. When he won the 2013 Indianapolis 500, Kanaan carried No. 11 on a Dallara chassis that also had serial number 11. During this offseason, Foyt learned that Dallara was producing a chassis with serial number 14 for a team to purchase this season. Foyt earned two of his four Indy victories with car No. 14, and his team has carried that number on one of its cars since his driving career ended in May 1993. Of course, Foyt snapped up chassis number 14 from Dallara this season, and Kanaan will carry the famous No. 14 on chassis number 14 this May at Indy. “I’ll take that,” the affable Kanaan said with a smile. “That’s how big the boss is about the Indy 500. That’s our biggest chance.